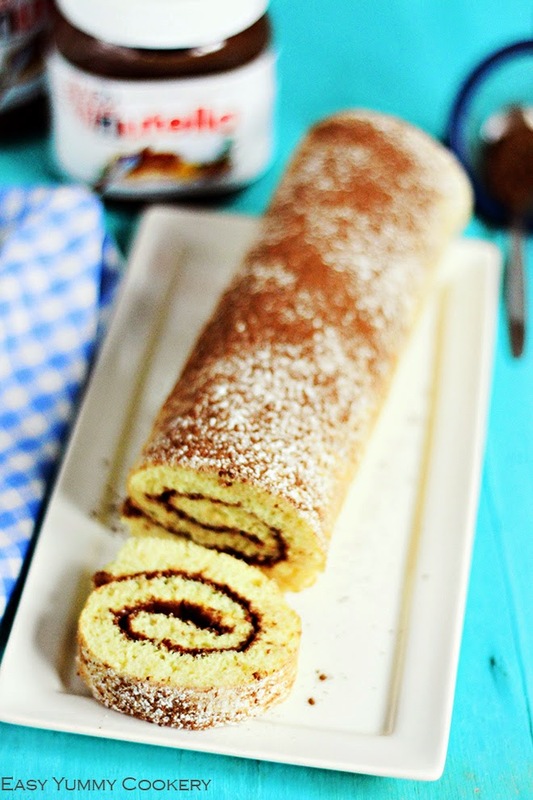 Swiss rolls are perfect for breakfast, tea time, kids party and what not! Homemade swiss roll tastes even better than store-bought ones. You will find no difficulty at all in making this recipe, it requires only the basic ingredients and yet tastes so good! Instead of using Nutella, you can always use any type of jam or if you're feeling a little bit fancy go for whipping cream. In this recipe I will be using a 26x30 cm tray you could use a tray of another dimension. Butter the tray then line it with parchment paper and butter again. Spread a spoon of flour and then tap each side of the tray so that the flour distributes evenly. Then add the honey, the vanilla essence and sugar to the mixture. Beat the egg mixture until it becomes pale yellowish in colour and thick in consistency (doubled in volume). Then fold in the egg whites in the yolks mixture, little by little until well blended. Folding is better than mixing as it retains the air bubbles in the egg whites - prevents deflating. You can sift the flour beforehand and then add it to the batter but I prefer sift mine alongside. So, add the flour to the mixture and continue folding. Remember you do not want the mixture to deflate. This is how your tray should look like after buttering up! Spread the batter evenly on the tray and bake for 6-7 minutes at 220˚C or until the surface becomes golden brown. Remove the tray from the oven and quickly remove the swiss roll along with the parchment paper from the tray. 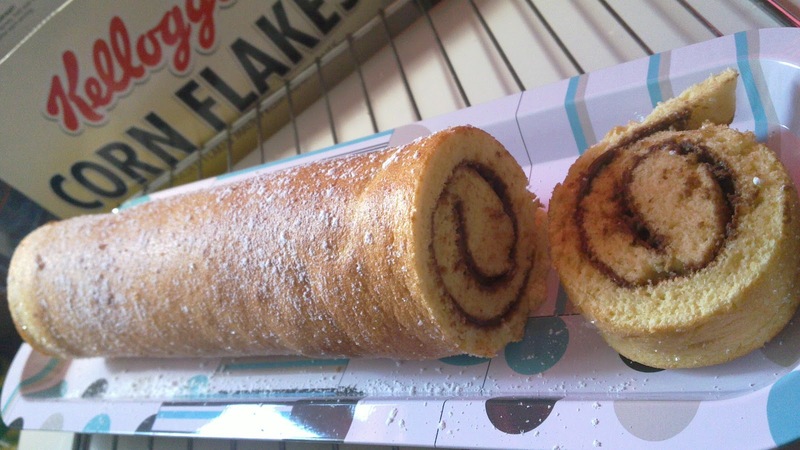 You could sprinkle some sugar (about a tablespoon) on the swiss roll to prevent it from sticking. Then cover the swiss roll with cling film and allow to cool. This helps the swiss roll to trap moisture and will make the cake spongy and will prevent cracks when rolling. Once the cake is cold, unwrap and brush off the excess sugar or all of them if you want. 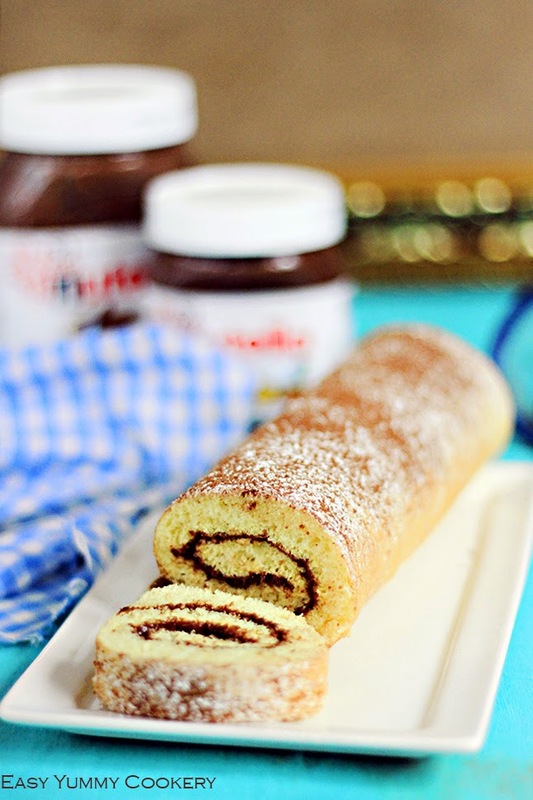 The amount of Nutella you want in your swiss roll is subjective. I will be using about 2-3 tbsp. For easy spreading, melt the Nutella in the microwave for 15-20 seconds. Then spread the Nutella on the swiss roll! You could cut the edges before adding up the Nutella, sometimes they become crispy. Ive kept the edges, I believe they were fine. Also if you find your swiss roll a bit 'dry', you can prepare a syrup with 1/3 cup of water, 1/4 cup of sugar (more if needed), 1 tsp lemon juice and 2 tbsp of vanilla essence (more if you want). Bring to the boil for about a min or 2. Add the syrup before you spread the Nutella. If you are not cutting off the edges, you can add more to the sides because they are usually more dry. Take the shorter side/edge and start rolling. When you are done rolling, hold the swiss roll for a few seconds to 'lock it' ! Dust with icing sugar. Tadaaaa, and you are done!! So easy and so delicious!